When your car breaks down, it's essential that you find a good repair shop to help get you back on the road. However, it's not always easy to tell which auto repair businesses have the knowledge and experience you need, as well as a reputation you can trust. According to USA.gov, one of the best ways to find a reputable auto repair shop is to ask friends, family, and neighbors for their advice. Often, you can get great recommendations from people you know and trust. Ask about the level of service, the quality of the repair, and the length of time your friend has been a customer. It's a good idea to get these recommendations before your car breaks down, so you can be prepared with the information when you need it. Are Aftermarket Car Parts as Good as Original Manufacturer Parts? When you walk into the repair shop, you should notice certifications displayed on the wall or window. The Federal Trade Commission recommends choosing a shop that displays the certifications of its technicians. 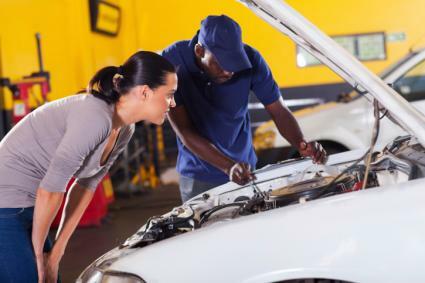 These certifications indicated that the employees are up-to-date on their training and are knowledgeable about specific aspects of your vehicle. In particular, look for a seal from the National Institute for Automotive Service Excellence. The Better Business Bureau (BBB) keeps records on most businesses and offers accreditation to those that provide excellent service and quality work. Before taking your car to the repair shop, check out the shop's reputation on the BBB site. You'll see if there are past customer complaints and how those issues were resolved. You'll also find out about especially great service the company has provided in the past. If your car is still under warranty, you may need to have the repair performed by the dealer. According to Edmunds.com, auto warranties vary, but there is a lack of clarity surrounding who can service your car and what parts can be used to repair it. This means that in some cases, you may not be able to choose a repair shop that isn't affiliated with the dealership. Violating your warranty can mean that your car is no longer covered under the agreement. If you're in doubt, call the dealer for more information. If you're looking at an expensive repair, take a few moments to compare rates. The Federal Trade Commission recommends that consumers call around to several area repair shops to find one that will provide the service at the best price. They also recommend that you ask about the warranty they offer on the parts and repairs and keep this information in mind as you compare prices. You can tell a lot about a business just by being observant. The National Institute for Automotive Service Excellence suggests that you start with the parking lot. The other vehicles should be of similar value to yours, and the lot and building exterior should be neat and uncluttered. The office and waiting room should be tidy as well, and they should include posted copies of fees and labor rates. Whether you own a Toyota or a Tesla, it makes sense to find a repair shop that knows your vehicle. According to Consumer Reports, shops that specialize in specific manufacturers have the most up-to-date training and equipment for working on those vehicles. This can be especially important for major repairs. According to Edmunds.com, taking your car to the dealership where you bought it has many advantages, including a better commitment to customer service, warranties on all work, quality parts, clean facilities, and technicians who specialize in your vehicle. However, there is a major disadvantage in terms of price. You can expect to spend up to $20 more for each hour of labor at the dealership. The Internet has changed the way people choose all kinds of goods and services, including auto repair. Consumer Reports recommends checking out a shop's reputation on sites like Yelp or Angie's List. You can find out how other consumers feel about their experiences with each company. The National Institute for Automotive Service recommends that consumers ask for references when trying out a new repair shop. Call the past customers to find out how they feel about the place and the quality of work they received. Not all repair shops are created equal. For the best service and the highest quality work, take some time to research the options in your area. You'll be prepared next time your car won't start, and you'll feel confident that you've made the right choice for your vehicle.